The panic in Europe over the waves of Syrian refugees surging across its borders is real enough, but the European Union could hardly have chosen a worse moment to rediscover its interest in Turkey. In the face of opposition led by France and Germany, the EU all but abandoned Turkey about seven years ago when, with accession negotiations working as an engine of reform, the country was becoming a real democracy. Now, influenced by German Chancellor Angela Merkel, who was in Istanbul at the weekend, the EU is re-embracing Turkey just as the country, under the increasingly one-man rule of President Recep Tayyip Erdogan, is in danger of becoming more like Syria. After meetings with Mr Erdogan and Turkish Prime Minister Ahmet Davutoglu, Dr Merkel gave her blessing to a basket of sweeteners in return for Turkish efforts to hold back the flow of refugees into Europe. The EU will reopen Turkey's stalled membership talks, accelerate visa-free access (offered to Moldovans but not Turks), and give Ankara €3 billion (S$4.7 billion) to help the country - already host to two million Syrian refugees - become a holding pen for the exodus still to come. This year's annual European Commission report, expected to contain criticism of Ankara's clampdown on freedom of expression and assembly, has been postponed. 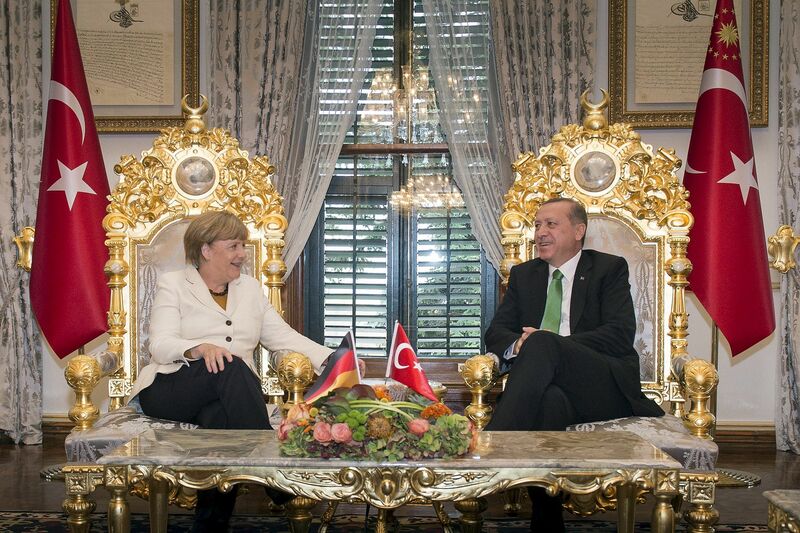 No wonder Mr Erdogan, rarely seen smiling in public these days, was pictured beaming at his meeting with Dr Merkel. Perhaps he thinks this could be worth a few points in the general election on Nov 1, which he called after voters deprived his ruling Justice and Development Party (AKP) of its parliamentary majority in June. But perhaps not, since most opinion polls suggest voters are sticking to their June verdict - and not that many Turks still harbour illusions about the EU anyway. The political gridlock in Ankara would be perfectly normal only if Turkey were a normal country. With its institutions buckling under Mr Erdogan's determination to move the country from parliamentary democracy to presidential rule, and with Syrian- and Iraqi-style ethno-sectarian divisions spilling over its borders, it is not. In the run-up to the June election, Mr Erdogan ignored his constitutional duty to remain impartial, just as he trampled on the rule of law after the June 2013 nationwide civic protests against his intrusive rule and the corruption probes into his inner circle in December that year. At rallies, the President called openly for voters to elect 400 AKP MPs (out of 550). When they gave the neo-Islamist ruling party only 258, he sabotaged coalition talks between the AKP and the Republican People's Party (CHP), the main opposition. This was not just because Mr Erdogan remains set on a big majority to upholster his power grab, but also because nobody can guarantee that the graft investigation he had shut down will not be reopened. But the President, who as prime minister opened talks with the Kurdistan Workers' Party (PKK) to end a 30-year insurgency, did more damage than that. His and the AKP government's lack of response to hundreds of attacks on Kurdish activists - culminating in this month's suicide bombings in Ankara that killed 102 people - has divided society and loosened the bonds holding Turkey together. It was the electoral breakthrough in June of the pro-Kurdish Peoples' Democratic Party (HDP) that thwarted Mr Erdogan's ambitions. In July, he relaunched the war against the PKK, even if the insurgents gave him a pretext by killing two policemen after the Islamic State in Iraq and Syria (ISIS) bombed a Kurdish cultural centre. Turkey's Kurdish minority of 12 million to 15 million in June closed their own fissures. Religious conservatives hitherto inside the AKP camp united with leftist Kurds behind the HDP, as did many Alevi Kurds who traditionally vote for the CHP. They concluded that Mr Erdogan's peace initiative was more about Kurdish votes for his super-presidency than reconciling Kurds with a Turkish state they now see as withholding protection. Turkey's Kurds accuse the AKP of complicity with ISIS, though the evidence points to negligence rather than collusion. That may change if the government fails to respond to the extremists' bombing of its capital. Certainly, the expansive regional policy through which Mr Erdogan and Mr Davutoglu pulled Ankara away from Europe towards the delusion of a neo-Ottoman Middle East, and the permissive Syria policy that turned Turkey into an extremist highway enabling ISIS to set up sleeper cells inside the country, has boiled down to the single issue of the Kurds. Inside Turkey, Mr Erdogan wants to drive the HDP below the 10 per cent threshold for entry into Parliament. He also fears that the success of PKK-allied Syrian Kurdish militia, taking ground from ISIS across northern Syria and legitimised by the support of United States air strikes, will create another Kurdish entity on Turkey's borders alongside self-governing Iraqi Kurdistan. ISIS has an interest in twisting the knife insofar as it is better for Turks and Kurds to fight each other rather than fight them. The extremists are helped by the ideology pushed by Mr Erdogan, a Sunni supremacist hybrid of Islamism and nationalism that, despite the tawdry EU deal, is cutting Turkey loose from its Western moorings and fomenting ethno-sectarian rifts. The EU needs to take a good look at itself as well as a Turkey where citizens are as likely to be prosecuted for tweets critical of their President as for association with ISIS.